A clean office is essential in order to have happy, productive employees offices views. Fully Insured Highly-trained Certified and most knowledgeable and highly experienced is our team of High-rise window technicians. We assure you that every man that gets on the side of a building has gone through rigorous training. We have safety meetings every 7 days. When we get call in to clean the windows on one of your prestigious building we all gather up (Skyclimbers) and study the building to accomplish your project in most efficient fastest and safest manner. You can bet at your building you will always have same team doing your job we won’t be pulling out moving around people we won’t be doing jobs before or after much less we will show up every day till complete. Our team is trained to spot and feel when something isn’t right and stop immediately and make sure everything is right (Safety Above All). 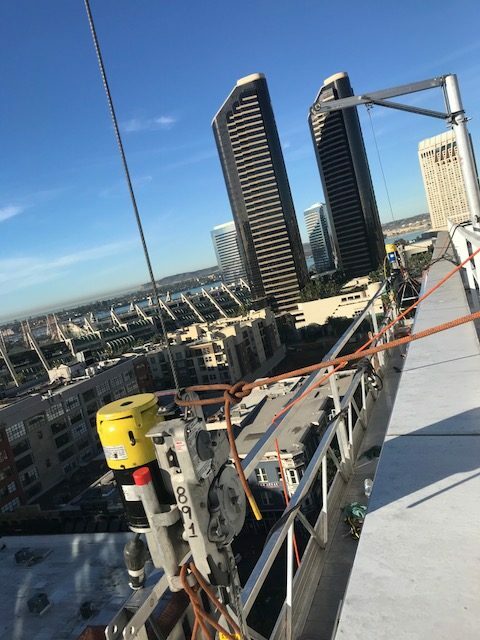 We do a 100-point inspection on our high-rise gear (Harness, Lanyards, ropes, descender, assendor etc.) night before the job. Every day before working and we double check gear and roof equipment before starting to work every day. While providing the High-rise window cleaning services, our team of professional cleaners guarantee that the job will be done at best quality and in the smoothest manner. Scaffold certification suspended and fixed Aerial boom and lift certification. When you need quality and reliable cleaning professionals in the San Diego County Area – you deserve a company that is dedicated to putting you first. SKYCLIMBERS Window Cleaning has built a stellar reputation for the extra care and attention to detail that you’ll appreciate with the Best customer service in the business. Copyright © 2018 SkyClimbers. All Rights Reserved.